The Anne Arundel Horse Council celebrated the landslide victory of George Johnson IV in the Sept. 12 Democratic primary over Dennis Callahan for county executive. Johnson spent a 14-hour day with the horse activists last month visiting the Virginia Horse Center, and he came away enthusiastic about prospects for a horse park in Anne Arundel County. Dennis Callahan, however, Continued made the fatal mistake of publicizing his opposition to the Horse Park in his campaign materials and in public appearances. The result was a staggering loss. Callahan got 38.5% of the vote, compared to 61.5% for Johnson. The county executive race is critical to the future of the Horse Park at the Navy Dairy Farm in Gambrills. Current County Executive Janet Owens surprised elected officials from other Maryland counties when she refused to support putting this lucrative facility in her county. Her position makes sense when you consider that her most generous campaign contributors have proposed mining gravel where the Horse Park’s cross-country course would be built. 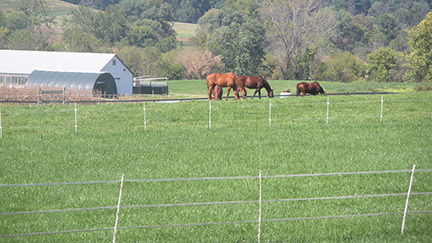 The next county executive will either shepherd the Horse Park in or block it. The Anne Arundel Horse Council met or communicated with all of the candidates from both parties. The Johnson win on the Democratic side was critical, since there are more registered Democrats than Republicans in the county. On the Republican side, the voters elected John Leopold. Leopold supports agricultural preservation and maintenance of open space, so he should support the Horse Park. To date, however, he has not been willing to take a position or even meet with anyone to get the facts. The horse council and its allies will attempt to meet with Leopold again, now that he is the Republican nominee.